Ready to put a little “Mad Max” in your landscaping thunderdome? You need a chainsaw on a pole. Afraid of the snarl and bite of a chain spinning at 60 mph near your arms and legs? 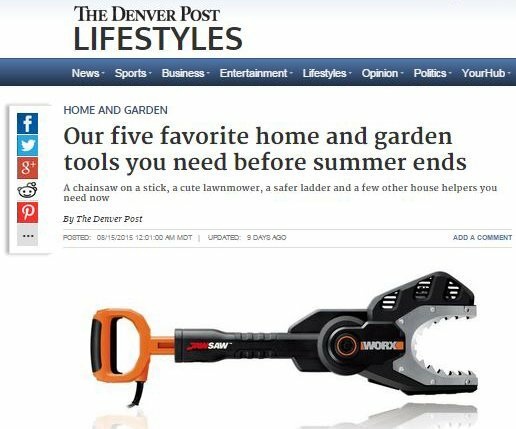 The Worx JawSaw conquers your fear factor. I have the 6-inch, 5-amp model, and it earned its $100 price tag the first time I used it. Professional tree trimmers won’t get out of their trucks for under $200, and this gadget can do almost anything the pros can do — up to about 12 feet from the ground, if you get the optional pole extension. The saw’s “jaw” is a horseshoe-shaped mouth that goes around the limb, and the device’s engineering — which requires you to simultaneously pull back on the handle and press a clutch at the thumb grip to sink the blade into the branch — makes it virtually impossible to cut yourself. The 6-inch mouth is wide enough to take down limbs as thick as an average man’s elbow. And after you bring down the limb, it’s easy to cut it into shorter pieces that fit in your trash bin or fireplace.